Maybe you haven’t heard, the engineers at Hunter Engineering Company® are at it again. In July of this year, Hunter Engineering Company® announced the launch of its latest vehicle service innovation, Quick Check Drive™. Quick Check DriveTM is an alignment inspection system that provides immediate alignment readings with ease and no room for human error. 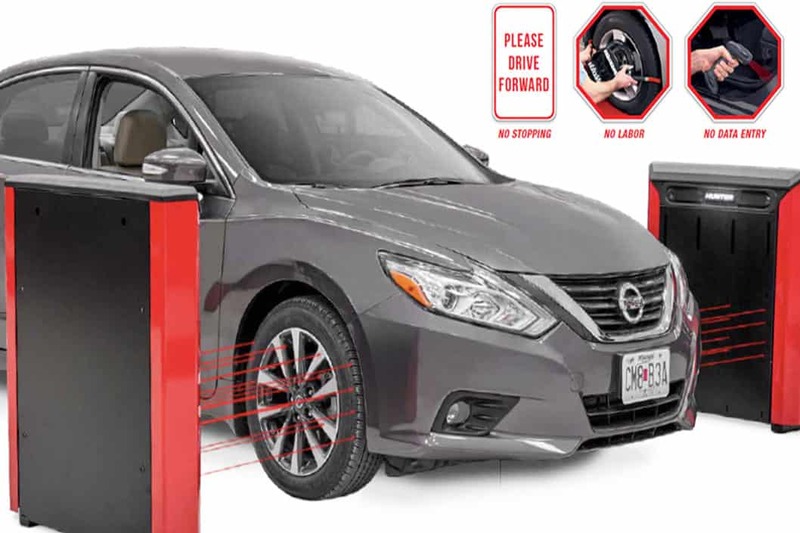 This valuable alignment inspection systems more than pays for itself with eight cameras and 32 laser sensors that have the capability of scanning a vehicle’s tires as they simply drive past. It eliminates operator labor, error and the need to stop the vehicle. accuracy and repeatability on every vehicle it inspects, this alignment inspection system is sure to be a game changer in the auto collision repair industry. In addition to providing total toe and camber readings, the Quick Check Drive™ embodies a vehicle identification system that captures front and rear license plates on each vehicle. This sophisticated system automatically provides a license plate-to-VIN conversion while determining OEM specifications on most vehicles all at the same time. All of this and the capability of scanning a new vehicle every 3-5 seconds. Auto accidents, curbs, potholes and worn parts are only a few factors that contribute to the 60 percent of vehicles on the road today in need of an alignment. This combined with the profitability when performing wheel alignment service make the Quick Check Drive™ a “must have” for any dealership, auto collision shop or wheel alignment service provider. As if that isn’t enough, the touchless inspection system can also be of added value when you add the optional body damage camera. This camera is capable of capturing more than 40 images per vehicle. A smart choice for those who want extra protection in detecting questionable damage claims. Give us a call today to find out how we can help your customers maximize tire life by correcting misalignment today! Check out the Quick Check Drive™ in action. If you’re in Delaware, Maryland, northern Virginia, the West Virginia Panhandle or Washington, D.C., contact ChesapeakeAutomotive Equipment to learn more about our full line of automotive equipment options. Chesapeake Automotive Equipment provides top-of-the-line general shop and automotive equipment to commercial automotive-related businesses ranging from independent mom and pop auto collision and repair shops to heavy-duty repair facilities to auto dealership groups along the East Coast.